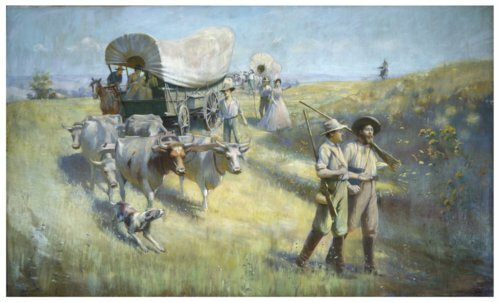 Small oil on canvas painting of pioneers and a wagon train descending from hill. Painting is a small study for a larger painting. In foreground, at lower right, two male figures carrying rifles. A wagon train painted in upper right. Wagons are pulled by oxen. Small dog in lower left. Women in Victorian dress, male figures, and horseman, walking near wagons. A seated Native-American figure in upper right. Because painting is a study, figures are painted with little detail. Pencil gridlines drawn onto painting by artist. Painting is housed in ridged gilded wood frame.